OMAHA, Neb. (KMTV) — The flooding has impacted so many people and their pets. 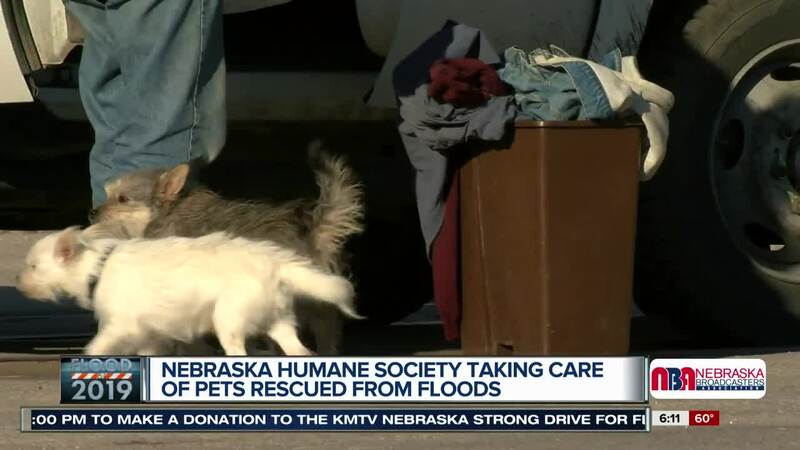 So the the Nebraska Humane Society is stepping in to help ease the burden for pet owners affected by the flood. "A lot of people lost everything and sometimes it's like I need a toothbrush and shampoo and a clean t-shirt, sometimes dog and cat stuff isn't quite as high on the list," said Vp of PR and marketing at the Humane Society, Pam Wiese. Right now the humane society is housing 75 dogs that were either rescued or being boarded due to the flooding. But there are still other pets in need. Werner trucking donated a semi for the humane society to use to house donations for dogs and cats affected by the flood. The humane society is collecting items such as food, water, treats and toys. "We also have a lot of crates which we know will become important for people who maybe need to house with their pets in a place where they animal can't be out loose like he was all day at their house," said Wiese. They are looking for anything to bring comfort to the pets who have already been through so much. "We know a lot of these animals are very traumatized by this so if we can offer a kitty a place to scratch, if we can offer dogs a toy to chew on, something that seems like normal I think that is very helpful for people," said Wiese. Every pet that is being temporarily housed by the humane society will go home with whatever they need to make a smooth transition. "If we can provide that for them than maybe that will ease their pocketbook a little bit at a time when people are really suffering," said Wiese. Donations can be dropped off anytime and there is currently no end date for when they will stop accepting donations.